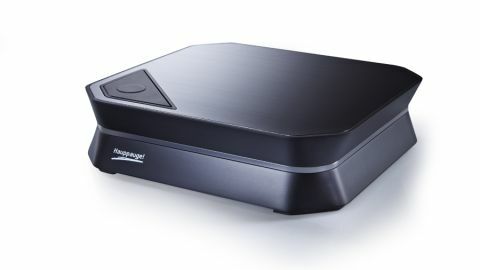 The Hauppauge HD PVR 2 captures output from things like games consoles and records it on your Mac or PC. Tell its app which cables you're using and it helpfully shows photos to verify the choice, and a textual description of the signal its receiving. A slightly delayed video preview can be displayed if VLC is installed, but the input is immediately sent to a TV to allow normal play. Video data rate and colour can be controlled from the app. Captures can be triggered from the application, or using the conveniently large button that sits atop the hardware. Recordings are stored as an MPEG transport stream, which OS X can't immediately play. Strangely, listed among Audio Encoder settings is one that automatically rewraps the media in an MP4 file. It contains H.264 video and MPEG-4 audio, which QuickTime and many other apps can read. Our Mac mini took just a couple of minutes to process an hour-long video, but this step isn't necessary with our existing champion kit of this kind. Recordings are broadcast to a server using the UDP protocol by specifying an IP address and port number, but you can't simply provide account details for services such as YouTube Live. Lack of convenience extends to simpler features, most notably that the app reverts to Component input every time it's opened.